I’d say there’s no better time than right now to discuss what we do with our money in light of the hundreds upon thousands of Ice Bucket Challenge videos that have been taking up most of the internet the past few days [FYI, Emily Blunt’s is the best]. Just yesterday my youngest brother posted one to Facebook, so it’s gotten just about as close to home as it possibly can. Now there’s been a lot of discussion about how this appears to be just the latest trend, which probably has a lot to do with the sheer number of celebrities who are getting in on this. What can’t be argued with, though, is the fact that in a very short time this challenge has resulted in over $50 million being donated for ALS, which is roughly 80% of what the organization raised last year. That’s big, that’s worth applauding. I’m going to end this paragraph on that note. What else it is, though, is fun. It’s fun watching people like Bill Gates and Nick Offerman get soaked in frigid water and calling out their peers. It’s fun when our peers do it to us, and when we in turn choose to douse ourselves in glacial H2O. That makes it easier to give, I think, there’s this pervasive lightheartedness about it that makes us more inclined to reach into our wallets and give howevermany dollars towards ending Lou Gehrig’s Disease [an ailment I only very recently connected to these shenanigans]. Giving gets infinitely harder when there’s none of that fun involved. I touched briefly on this general topic last summer, though I narrowed the scope to navigating street canvassers asking for monthly donations to their myriad of charities. In the end I settled on selfishness for being the reason most of us don’t make that commitment, but it’s those who once cried “Alms for the poor” that come to my mind today. When I was studying abroad in London many of my classmates found themselves in the largest city they’d ever been in, faced with the problem [let’s not pretend the fact that people find themselves having to beg is anything but that] of what to do when asked for money. One of them mentioned what I believe many others turn to, which is asking said person if they were hungry and then buying them some food if they are. I’m not going to say that’s not a great course of action, but it’s also not always feasible. Let’s be fair, a lot of the time we’re out and we have things to do, and handing someone some change could end up resulting in them getting fed as opposed to getting drunk or high. Or both, I mean, I don’t know. The thing is, we can’t control other people. That’s true on the grand scale, but especially when it comes to the disenfranchised. To a point, all we can do is give and hope they make the right decisions. It’s not enabling them, it’s letting them make their own decisions. As a Christian I feel called to help those who need it and share what I have. As a person with money that I can spend on things like Tim Hortons Iced Capps when I feel kind of thirsty it practically goes without saying. I have and others don’t, I can afford this. Then you have situations like today, when I stood waiting for a streetcar and a man who was missing some teeth came up to me and asked if I had any change. I told him the truth, which was that all I had in my pockets was a dime, which I gave him. He saw the subway token and asked for that as well, so I gave it to him. He then asked me if he could have two. I told him it was literally all I had and he walked away. 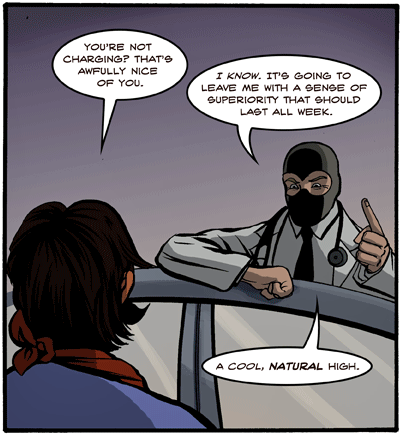 Okay, Dr. McNinja is fictional and cannot always be trusted. I guess the question I want to pose to you, [the assumed majority of] readers, is how do we give? If we can admit to ourselves that we’re privileged enough to have roofs over our heads and not completely empty fridges then what is our next course of action? Do we have a responsibility to help others, and if so, how? Given what happened today I definitely don’t have the answers, but I hope that I [and you] can get there eventually. This entry was posted in celebrity, internet, money, morality and tagged alms, ALS, begging, charity, disenfranchised, donating, donation, fun, giving, gratitude, have, have not, Homeless, Ice Bucket Challenge, money, philanthropy, poor, privilege, responsibility. Bookmark the permalink.